Thank you for visiting my site. I hope it provides you with an insight to Spirit Portraits and the understanding of Mediumship. My work is simply to facilitate bringing awareness of LIFE after LIFE to promote self-healing, clarity, hope and upliftment to all that now seek their spiritual awakening. I am a Spiritualist, loud and proud lol. I believe in the afterlife, I believe that as spirit we are forever evolving and the experience we chose to embrace whilst living a physical experience is of our own personal responsibility of how we wish it to be. I believe, in order to be happy one must take pride in he fact that we MADE IT... to be here, alive in a world of matter, how amazing? The 3 loves in my life (apart from family) are Art, Teaching and Mediumship. I believe creating Art can help to reduce stress and heal the emotional and mental state of self. However, Spirit Art Portraiture is a visual interpretation through spiritual communication which is another way a Medium (Artist) can prove 'life after life' that our loved ones conscious mind has survived Death. Your Loved ones are taught on the other side how to transcend their thoughts to the physical mind of a Medium, giving evidence on their past life as a way to prove (visually) that they are consciously very much alive albeit in a different aspect of the Spiritual realm. 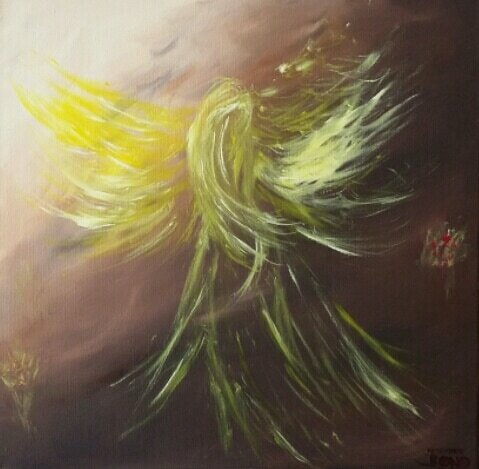 I am a Psychic Artist, Medium and Spirit taught, Spirit Artist. Not everyone can afford to study or take time off to study at various courses around the country. so it's my mission that anything I learn plus with my personal experiences and spirit taught exercises goes directly into my teaching. I have studied mediumship in various colleges around the UK, but my main two areas of training was developed under Tony Stockwell's mentorship scheme whereas previously my main (and continued development) is at a LEADING development college in Essex (AFC). I enjoy it so much there that just recently I went 13 times in one year!! I'm affiliated with the SNU, and completing their education programme went onto to gain my CSNU level (Certificate holder of the SNU) both for Speaking to an Audience and Demonstrating Mediumship from the Platform. In 2014, I was also one of the 4 winners of the Gordon Higginson Mediumship Scholarship and no matter what, I'll always be continuing the development of my mediumship and you never know I could be sitting next to you at your next mediumship workshop!! I am a Professional Tarot Reader with over 20 years experience, also continuing my life long learning as a developing Spiritual Medium & Artist. As a Spiritual Teacher, Author and IT Trainer, my experience at managing and teaching large groups excels 30 students at one time. I hold the TAP DIPLOMA awarded to me in 2015 for Learning Facilitation. I hold other TAP qualifications in Training & Delivery, Facilitation, Coaching, Effective Presentations, Learner Engagement and Training Design and Development.